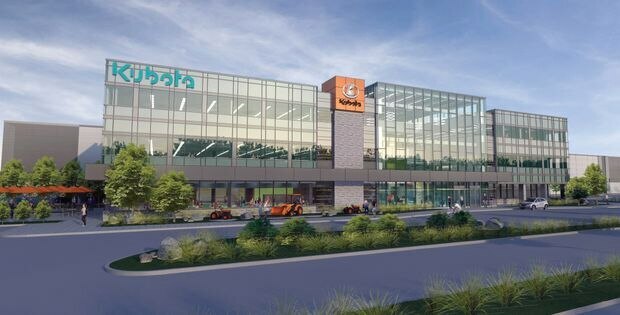 Kubota Canada has purchased 50 acres in the Pickering Innovation Corridor to build its new warehouse and head office, as shown in the rendering. Construction is to begin next spring and wrap up about a year later. Kubota Canada Ltd. had to look farther afield to find the space it needed as it ran out of room for its growing head office and warehousing needs. The tractor and heavy-equipment maker announced it’s moving from Markham, Ont., where it’s been located since 1975, to a more affordable site in the Pickering Innovation Corridor along Highway 407 in the Durham region at the eastern fringe of Toronto. “We started looking in Markham, Scarborough and Unionville, but there were few parcels in the 40- to 50-acre range we needed and the pricing was really getting up there,” said Bob Hickey, president of Kubota Canada, a subsidiary of Osaka, Japan-based Kubota Corp. The newly developing Pickering land was available for half to two-thirds the cost of sites closer to Toronto. Rising prices and diminishing supply of big parcels of land are realities driving development of logistics centres and warehouses to the far edges of the Greater Toronto Area, said Mike Czestochowski, executive vice-president of the land services group of CBRE Canada. Despite a moderation of the GTA’s single-family housing market, there has been no corresponding decrease in either demand or price of developable land, a new CBRE study has found. The study says prices paid for raw land and the annual volumes of sales have nearly tripled in the GTA over the past decade. In the first half of 2018, the average price for a single acre of raw low-density land, which is used for single-family and semi-detached homes, surpassed an average of $1-million for the first time. A decade ago, that same acre cost $382,000. Prices of serviced high-density land for condominium and rental apartments and commercial use have also more than doubled in the same decade. Demand for big plots of residential and commercial land is also far outpacing supply. 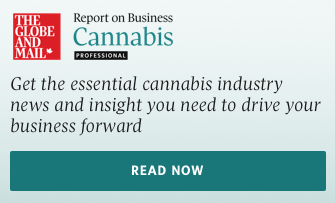 “Companies are looking further afield, simply because they need the contiguous land that’s getting difficult to find in mature areas with developed infrastructure,” such as Markham, Richmond Hill and Vaughan, abutting Toronto, Mr. Czestochowski said. “The biggest growth in industrial space today is what we nickname ‘big bomber’ spaces: large logistical warehouses that service the online shopping phenomenon. In order to accommodate them, we need bigger parcels of open land than is available in Toronto or its immediate suburbs. We’re seeing them go further out, to Milton, Brampton and Durham region,” he added. These developments can have huge footprints. For instance, a 500,000-square-foot logistical warehouse will have more than 11 acres under its roof (there are 43,560 square feet in an acre), plus additional land needed for access and parking. It’s a phenomenon that’s happening in metropolitan areas across Canada. “Today, an international company won’t just look only at Toronto, they’ll look at several cities and weigh costs of shipping, access to highways and where their employees are located,” Mr. Czestochowski said. Calgary has seen a surge in commercial logistics development this year after a relative lull in 2017, with much of the activity being in the city’s periphery. CBRE stats show there were almost four million square feet of new industrial space under construction in the third quarter of 2018, the largest since the first quarter of 2015. A notable new addition is a 600,000-square-foot Amazon fulfilment centre in Balzac, 24 kilometres north of Calgary. And in Montreal, after the opening of a new container terminal at the Port in Montreal, developers are looking for land further away from the main island as available land in serviced areas is in short supply, a recent CBRE North America Logistics and Seaports report found. Permit applications have increased, but much of the proposed development is not yet under construction. Meanwhile in the GTA, Kubota is thinking even bigger. “We bought more land than we initially need, but we’re planning to have the capacity to continue to expand,” Mr. Hickey said. The company’s warehousing needs have doubled in the past seven years with acquisitions of other companies and new product lines, including farm and loading equipment. It purchased 50 acres of land – an increase from the 20 it owned and leased at its current location on the east side of Markham. The company is building a 500,000-square-foot warehouse in Pickering, plus an additional 65,000 square feet of head office space in its first phase, due to open in 2020. But future phases could see the campus expand to more than a million square feet, along with additional testing, training and logistics facilities, Mr. Hickey said. The site is part of the Pickering Innovation Corridor, which comprises 800 acres of formerly provincially owned land along Highway 407 between York-Durham Townline Road and Brock Road. The province sold the city the strip of land, which was part of a large parcel of land being held for a potential airport. An extension of 407 has made the area a more attractive site for commercial development and the airport development is still a possibility. How much further can industrial spread in the GTA go? Mr. Czestochowski sees Bowmanville and Clarington to the east and Halton, Peel and Durham regions as having potential for future logistics development. Beyond that, there’s the greater Golden Horseshoe, Hamilton and St. Catharines. “We haven’t seen much logistics growth in those outer areas yet, but that may be the new frontier,” he said. Area: 565,500 square feet, with the possibility of increasing to 1,000,000 square feet in the future. Investment: Approximately $67-million for the land and building. Workforce: Kubota Canada plans to grow to 250 employees by 2027 from 190 currently. Construction start: Spring of 2019. Move in: Summer of 2020.